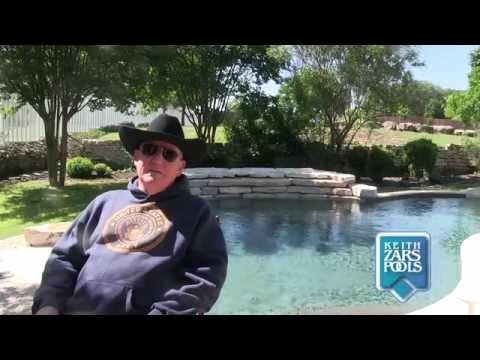 Since 1985, Keith Zars Pools has designed and built magnificent custom swimming pools in San Antonio that integrate seamlessly with their natural surroundings. Our breathtaking pool designs and extraordinary craftsmanship vanish the lines between indoor and outdoor living and create an oasis of tranquility. We stake our reputation on fine design, quality craftsmanship and our personal commitment to give YOU, the customer, our absolute best. Our customers’ complete satisfaction is our number one priority. We work with you every step of the way to create a unique outdoor environment that is a reflection of your lifestyle. What’s more, Keith Zars Pools stands behind every pool we build to ensure total customer satisfaction. If you would like to learn more about our company, learn about building swimming pools, or see more of our beautiful swimming pool designs, start following us on our social media sites! Keith Zars Pools is synonymous with luxury. We build our residential pools to the highest quality standards in the pool industry. Our full complement of in-house resources ensures that your custom pool is built on time, by our employees and is backed by a 100% satisfaction guarantee. San Antonians prefer Keith Zars Pools over the competition 3 to 1 and we would love to share with you all the reasons why! From hotels to destination resorts, to apartment complexes to waterparks and more, Keith Zars Pools brings the element of fun and design to commercial projects. Built to the highest commercial standards, exceptional quality is married with timeless design and luxurious materials. We take pride in our pools, and we love our customers, so we have a full customer care department available when needed. Our technicians are available six days a week to ensure your pool stays in great condition. Does your current pool need updating? Keith Zars Pools specializes in swimming pool renovations. Creating a fresh, new look will undoubtedly make you fall in love with your backyard again!